Price Oscillator (PO) is momentum oscillator in technical analysis which shows difference between two moving averages. Price oscillator is based on exponential moving average. For short EMA period is usually used value of 9 and for long EMA value of 26. Generally, buying and selling signals could be created using zero line crossovers: buy signal when PO crosses above zero line and sell signal when PO crosses below zero line. 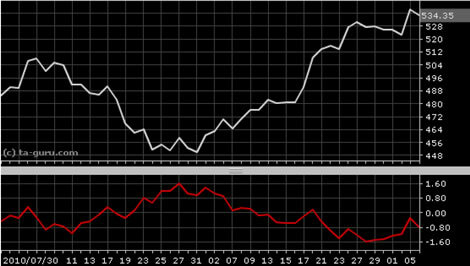 Open chart for google with price oscillator.